"The core idea behind the project replaces the monetary value of a bottle of water with a different type of currency; walking distance. This initial concept allowed us to bring the reality of the distances children walk for water in Somalia, particularly in times of crisis, to a global audience. It also provoked an emotional response in viewers by making them consider their own easy access to water. We brought this idea to life with a hidden camera, social experiment video, that caught people’s attention through a series of unexpected twists that overturn expectations and evoke empathy to the point that they feel compelled to share the video with others." "UNICEF calculates that more than 180 million people do not have access to basic drinking water in countries affected by conflict. Many children in drought-affected areas spend hours every day collecting water and therefore miss out on being able to go to school and score a good future. Often, the water that they collect is contaminated with with water-borne bacteria that can cause serious illness and death. This is the situation that many children in Somalia face. UNICEF has been working in Somalia to secure safe water access for all children which was the inspiration for this film project, made in collaboration with UNICEF Somalia." "The fundamental aim was to get people to literally walk in the shoes of a Somalian child for a moment; by doing so, considering their own easy access to water." 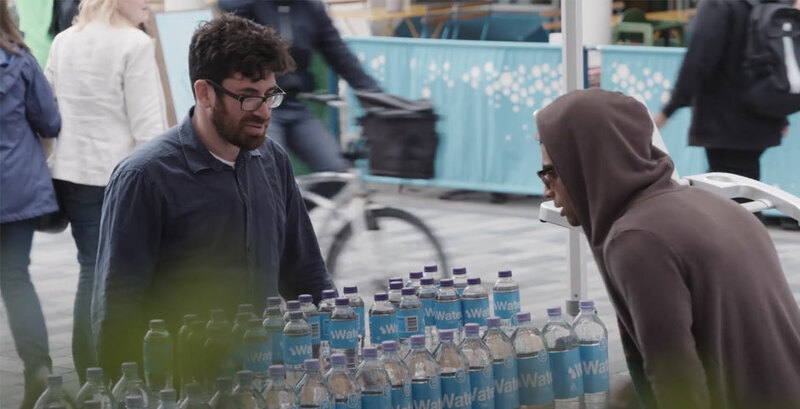 "The most challenging part of the project was considering how we could get people to go through the experience of walking kilometres for water in Somalia. The breakthrough moment was the idea of incorporating the treadmill into the experiment, therefore we could literally get people to 'walk for water.'" "The aim of the project was to create something that would be able to travel as broadly as possible across social media, therefore the medium of film was essential to conveying the message in this context. " "The greatest challenge was in the conceptual stage. How could we create an interesting narrative arc and then secondly how could we anticipate what the response would be from the people that engaged in the experiment. The most rewarding moment was after it went live on social media and seeing how widely the video had been watched and shared with 23 million views worldwide." "The process of creating the video highlighted that presenting an audience with something new generates a higher and more positive response rate. Secondly, the use of humour is a powerful tool in connecting with people, especially when the overarching message is a serious one. For example, people are more likely to share a video that is funny and lighthearted than a serious didactic one, which ultimately furthers the outreach." Often, the water that they collect is contaminated with with water-borne bacteria that can cause serious illness and death. This is the situation that many children in Somalia face.